Personalize the center engraved heart with your text. 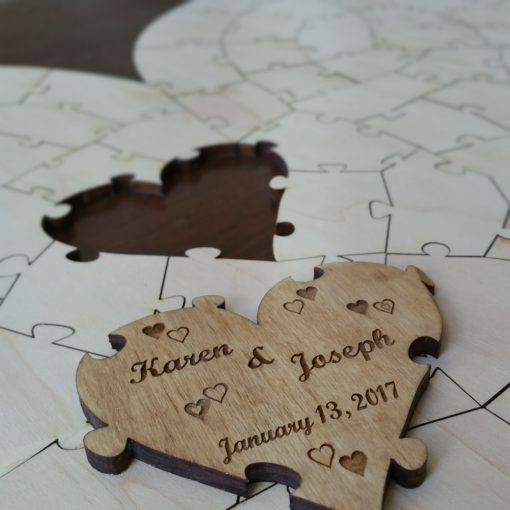 This unique and thoughtful puzzle guest book is an exciting and warm way to involve your guests at your event. It’s also a great way to record and remember any special day for a lifetime. Frame it and hang it on your wall, or challenge yourself by putting it back together down the road. 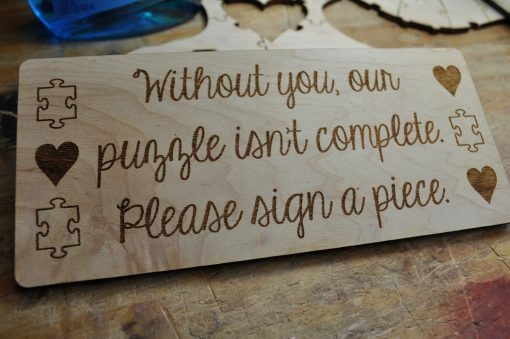 The puzzles are large, with good sized pieces, allowing guests to write more than just a name. 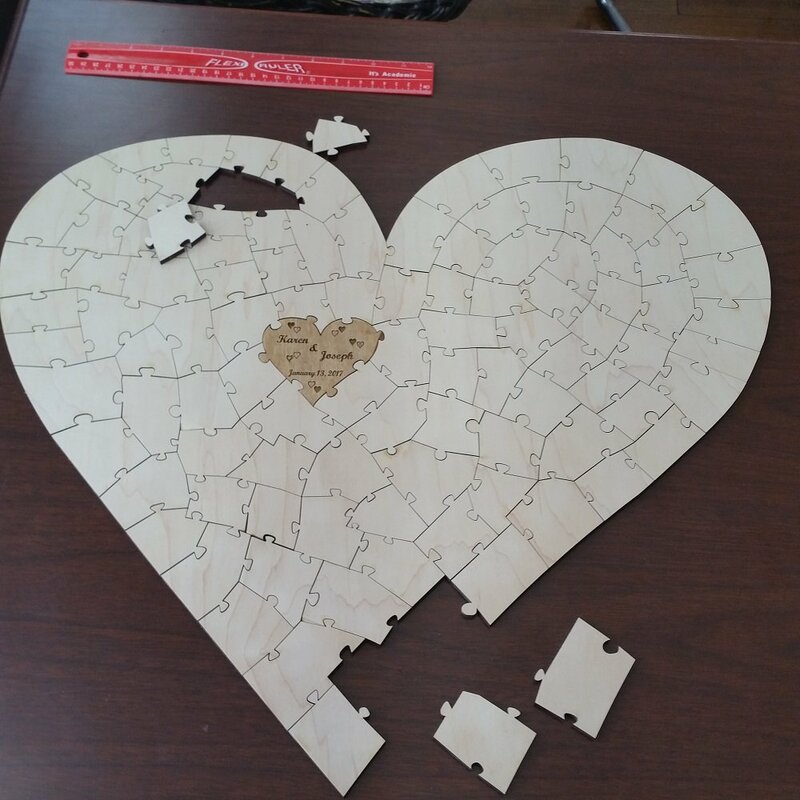 As the number of pieces in the puzzle increase, the overall size of the heart increases. Make sure to leave a note of exactly what you want engraved. In the case of the item pictured, this would be “Karen & Joseph January 13, 2017” You may also choose something like “Mr. 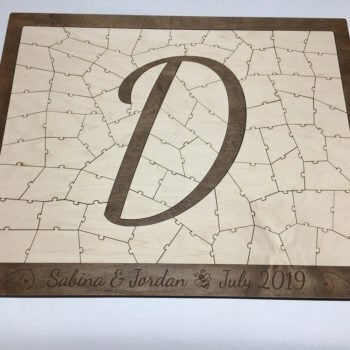 & Mrs. Avery 7-10-19” or “Jenny’s birthday party August 5th 2019” Anything in parenthesis will be considered a shape or symbol; for instance you may want something like “Addison (heart) Cameron” and a heart will be engraved between the two names. 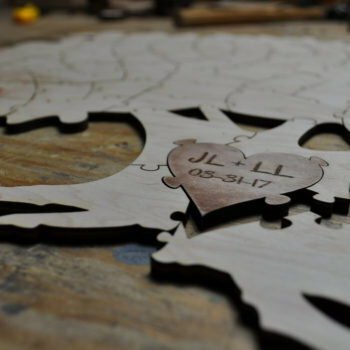 Whatever you choose, the engraving will be designed to look and fit as best as possible within the heart. The item is made of 1/4 inch thick maple wood. 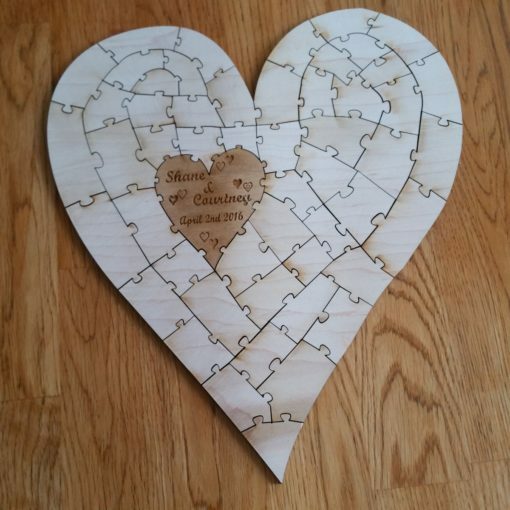 The heart piece with the names on it has a dark stain added to it. 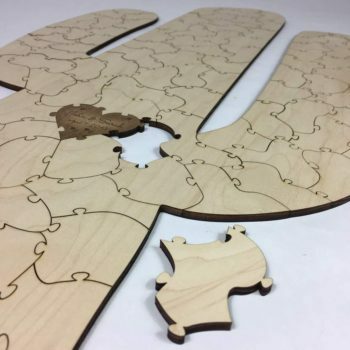 The back sides of the pieces have a dark stain on them, so you can tell the front from the back. 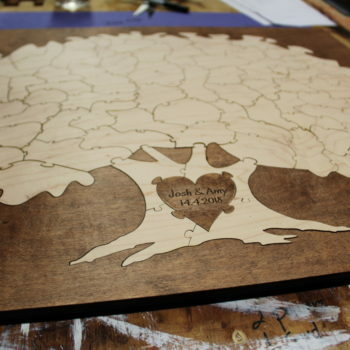 We also make a puzzle guest book in a tree shape. 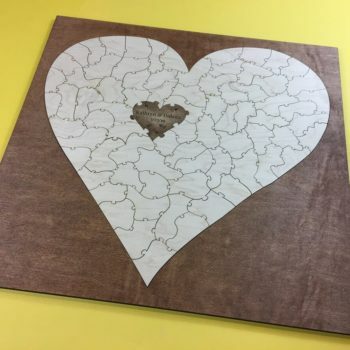 If you’re looking for a different style guest book alternative altogether, you may like this idea. If it ships by USPS priority, typically takes 2 or 3 days from the ship date to arrive anywhere in the lower 48 states. Tracking info will be emailed to you once the item is shipped so you can track the package. If you’re in a time crunch and need the item fast, don’t hesitate to contact us by filling out the contact form or by directly emailing crg8284@gmail.com. Our goal is to please you and we are here to serve. 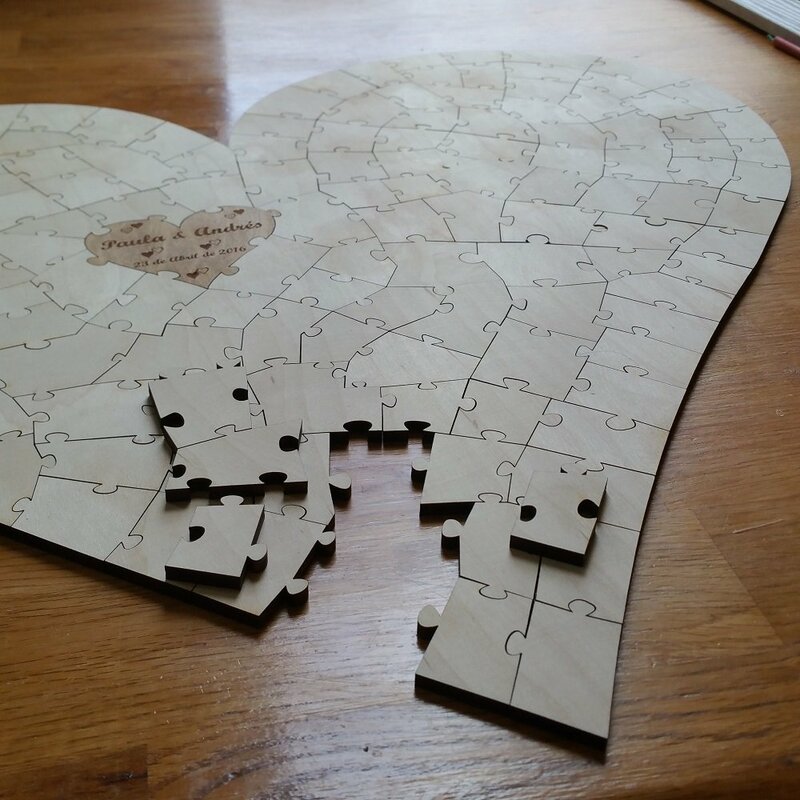 Such a wonderful puzzle and well made. We are excited to share this with our guests and use for years to come. Only slightly negative remark was no image or cheat sheet for the puzzle was included, but we just took a picture and added it in our box. Love the free guest sign instructions too. Awesome choice! 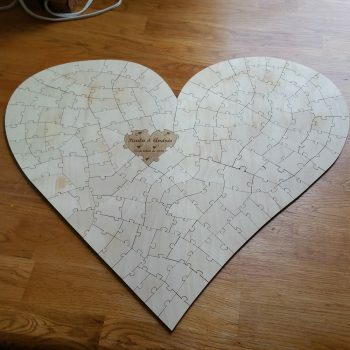 The 100 piece heart made a wonderful “sign in book” . The heart was well made and the pieces fit perfectly. 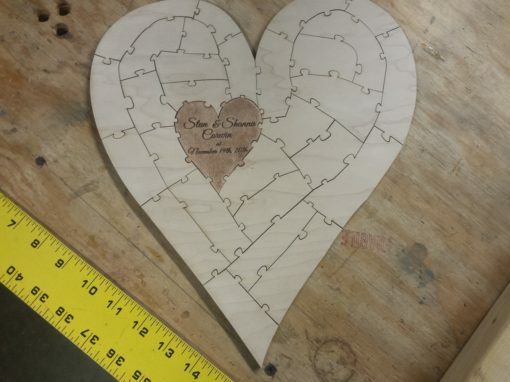 The center heart was done very well and was written exactly how I wanted it. 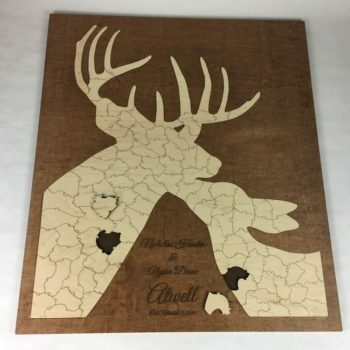 Also the box that was ordered with it was also made very well.